Hi everyone, I found this cute pattern to make a soap cozy on Pinterest and I thought that I would share it with you too. 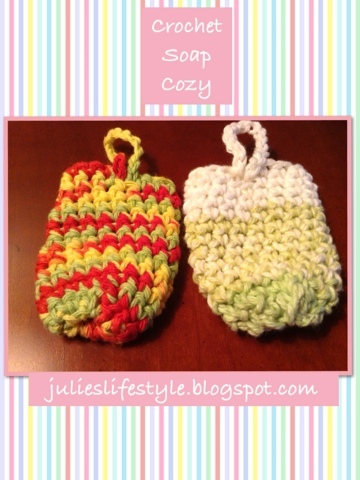 If you like simple projects to crochet than this is the one for you. This would make a great gift for the holidays too. You just put the soap inside the cozy and use it in the shower or bath and I used L'Occitane soap, which I love! 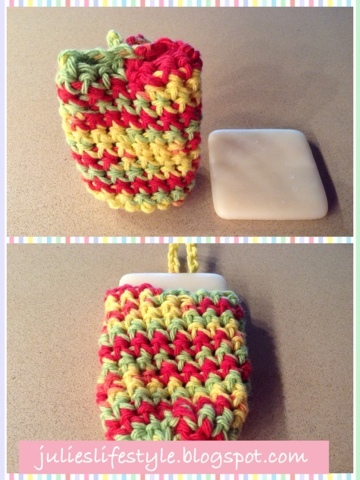 You can use cotton yarn to make this crochet soap cozy. I used the left over yarn from the dishcloths that I have been making. The cotton yarn is Sugar n' Cream and the color is Peace for the cozy that is red, yellow, and green. The cotton yarn is Sugar n' Cream and the color is Lime Stripes for the cozy that is light green and white. To make this soap cozy the pattern is HERE. I hope that I have inspired you to make this little project and it is so fast and easy to crochet. Have fun with this and let me know what you think. Rhondda of Oombawka Design for featuring Crochet Baby Blanket HERE. Tracy of Crochet Happy for featuring me two times on her blog and for the latest project Crochet Baby Blanket HERE. Melissa of Mel's Daisy Patch for featuring Crochet Coasters Pattern HERE. Thanks everyone for your support and appreciation of my crochet work, it means a lot to me! This is so cute and fun! What a clever idea :) Have a lovely evening. I love Sugar n' Cream yarn! That Peace yarn is really cute! Hi T'onna, yes I love using cotton yarn too! Hi Rhondda, thanks again for your featuring me last week and a fun fiber link party! I love projects like this....projects I have a chance of making! haha! I'll follow the link! Congrats on your features! WOW! Thanks Diane for your sweet comment! Such a cute soap holder. How clever. Thanks for visiting my blog and leaving such a nice comment. That's so neat, where did you learn to crochet? Hi Rose, I am self taught and I learned by reading and looking at crochet books 10 years ago and by a women in my Tuesday crochet group she sat down to teach me a few stitches. I have a passion for crocheting and I Iove it! Very cute and useful! These would be great for kids! I wish I could crochet! I might have to learn! Tweeted and Pinned! Thanks so much Dawn, yes for kids is a great idea! I have some of that yarn, I think I will give it a go. Looks easy enough, which is what I need. I do love to crochet but can only do basic things. How adorable is this soap cozy!? I've never seen anything like this for soap. Love the bright colour combination; a real perky way to start your day in the shower! What a cute idea. Thanks for joining us this week at the Let's Get Social Sunday party. Have a wonderful week. Julie, this is really a cute idea. I tell you, I need to learn to crochet! Thanks for sharing it with SYC. 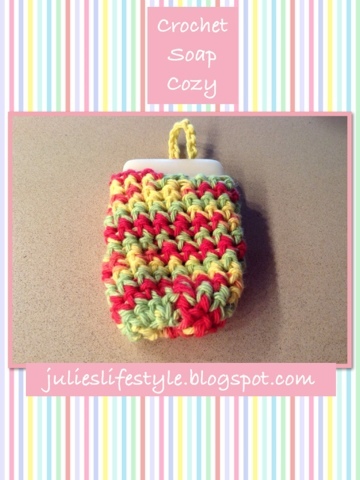 Soap cozies are so great! Thanks for linking up on Hookin On Hump Day! Such a cute idea Julie! Super cute, Julie! They are really perfect for gift. Thanks for sharing this lovely idea!